A night of records in playing basketball in LF2? Pierre Bressant does not like playing basketball in Pleyber-Christ. Last season he complained about the cold. This year he has nothing to complain about because his team won in overtime (78-75) with - according to the statistic sheet - a perfect shooting night. Lyon went a perfect 31-from-31 while Pleyber-Christ finished with 26-from-26. Forgetting the stats, Pleyber-Christ gave Lyon a scare. When Marie Butard connected to put the hosts in front in the last minute of the game (68-66), the home fans were anticipating a victory. However once again Geraldine Bertal came to Lyon's rescue to bring the teams level (68-68) with 30 seconds. Both teams had chances to win the match but the ball refused to drop and the game went into overtime. Leslie Ardon's (16 points) and Bertal's (27 points) experience made the difference in the end with the LF2 leaders going on to win (78-75). With this victory Lyon are the first team to qualify for the Ligue Féminine final four. Voiron had to wait until the second half (24-24) to get past the CFBB (61-43) while Dunkerque beat Limoges (68-60). Limoges and Voiron are tied for fifth place, nine games behind Lyon with 8 games left to play. Roche-Vendée left it late but did just enough to win on the road against Pau Lacq Orthez (59-58) to remain in second place. Armentières made it 7 wins from 7 games with a victory against Reims (72-55), while Nice escaped from Strasbourg with a victory against the SIG (64-63). Elise Prodhomme (left) scored 16 points as Angers beat Perpignan (62-52), while her former club Rennes fell at Aplemont Le Havre (62-41). Five teams are currently tied for tenth place with 30 points. But Dunkerque and Le Havre have played one game less. This means that SIG's negative series now see them playing basketball in the relegation zone. Only the CFBB has a worse record in the second round. 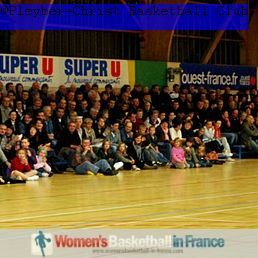 Look back on the previous round news for women playing basketball in the Ligue Féminine 2.